Edmonton Overhead Crane Certification - The overhead crane certification course is a program which is designed to assist trainees, even if they have language or literacy restrictions. The course comprises a classroom theory portion and a practical hands-on training session. Upon successful completion of both sessions, the individual participating will become certified. Each and every graduate would receive a wallet certificate of achievement. The program is designed to provide a basic understanding of the efficient and safe utilization of overhead cranes. 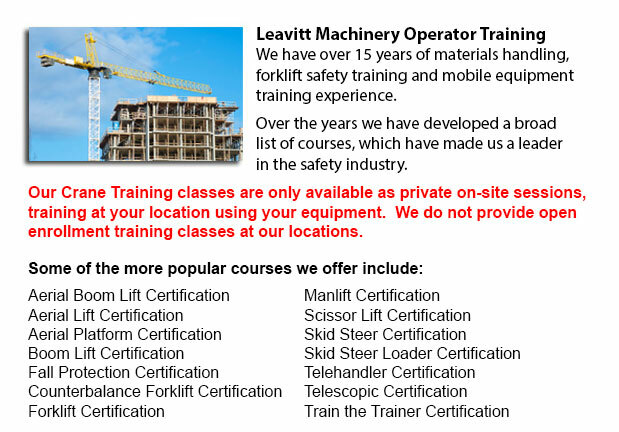 The crane operator training course has three primary objectives: to teach the basic concepts included in the operation of gantry cranes, jib cranes and overhead cranes; to lessen the likelihood of incidents and machinery damage; and to produce competent operators well trained in safety problems. The overhead crane is a common heavy equipment utilized in industrial environments. This machinery is referred to as a bridge crane and consists of parallel runways spanned by a traveling bridge. The hoist is the component which lifts materials. The hoist travels along the bridge. The overhead crane when used for maintenance or manufacturing applications will offer more efficiency compared to a mobile crane. This particular type of crane is also commonly utilized in the steel business. Steel is handled using an overhead crane at every stage of the manufacturing process, from the time the raw materials are poured into the furnace up to the time the finished coils are lifted onto trains and trucks. Overhead cranes are likewise commonly used in the automobile business and paper industry. The removal of heavy press rolls and other machines at paper mills is done utilizing bridge cranes. Bridge cranes are used to install the heavy cast iron paper drying drums and various huge equipment used in paper mills.